It was said too much about great Armenian son William Saroyan in past. It gone too much time with a silence about him. A new Newsletter is been published in San Francisco, California. If there are ANY comments, memoirs, links or critics, please post here. Let us together not allow this name and his heritage to be forgotten. directorial debut of Meg Ryan. yearning to be the fastest two-wheeled messenger in the world. hope and horrible news from the war front. Tom Hanks plays Mr.
screening of Ithaca at 3:30 PM. with his siblings and his mother. also cast in the movie - was 8. `I kept thinking, `How do you become a man? many great ideas inside of it,' she said in an interview with Deadline. year, Saroyan won the Academy Award for Best Story for this film. PanARMENIAN.Net - Although the opinion of Hemingway, who was a popular writer at that time, was very important and weighty, it could not prevent Saroyan’s appearance in literary world. Saroyan’s influence on American literary life was so great in 1930-1940s that he became an embodiment of new philosophy of values. During the years of Great Depressions his evergreen optimism revived hope in lots of desperate hearts. Henry Miller offered him to work on joint projects, while Charles Bukowski and Jack Kerouac were inspired by his inner freedom. Nevertheless, Hemingway gave a hostile reception to Saroyan, who was perceived as a phenomenon of life and a symbol of his time. However, according to Maslennikov, Saroyan’s view of life was broader. His heroes – sincere people – try to learn to live in an absurd and cruel world, but still believe in justice and love. “Hemingway’s heroes remain unconquered after the battle with life, while Saroyan’s heroes come out the victors,” he said. “He couldn’t come to terms with his age. I think people die because they want to die. You just should not agree to die. 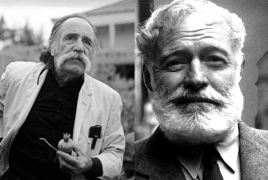 I, for example, could have been dead for a long time, but I do live,” Saroyan wrote about Hemingway. Hemingway was found dead of a shotgun wound in the head at his home on July 2, 1961. His wife, Mary, said that he had killed himself accidentally while cleaning the weapon. Saroyan died in Fresno, of prostate cancer at age 72 on May 18, 1981. Half of his ashes were buried in California and the remainder in Armenia at the Komitas Pantheon. His final statement for publication after his death was: "Everybody has got to die, but I have always believed an exception would be made in my case. Now what?" The Intellectual Renaissance Foundation, within the framework of the "Saroyan House" project, started the construction workս of the well-known novelist, American-Armenian playwright William Saroyan's house-museum in Fresno, the Intellectual Renaissance Foundation told Panorama.am. To remind, the foundation acquired the writer's house in 2015, and for about a year the foundation was engaged in studying the life and work of W. Saroyan, was searching and collecting the materials about him, as well as working together with the "Storaket" architectural studio was busy to develop a house-museum concept. And now, it is high time to start the construction work. The construction work starts with exterior appearance reconstruction, and after getting the corresponding agreements with Fresno City Municipality, interior work also will start. The house-museum is scheduled to open on 31 August 2018, on the 110th anniversary of the writer.